Our beautiful condo sits on a dramatic bluff on the spectacular North Shore of Kauai. It is fully furnished with all the amenities for a comfortable and memorable stay. 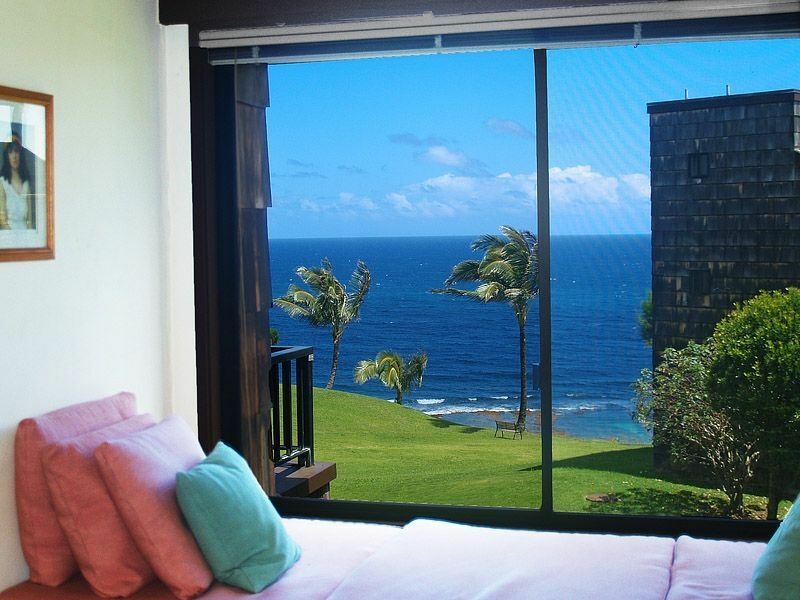 Outside the living room and bedroom windows you can see the surf pounding over the coral reef. Outside the kitchen and back porch are the dramatic and lush mountains with their ribbons of waterfalls. Our two bedroom, two bath condo is light and airy with a two story cathedral ceiling in the living room. Sealodge is a low density complex surrounded by a large green belt. In the area are the Island's best beaches, golf courses, and activities. Don't hesitate to call or email for further information about the unit or the area. Cathy and I are ardent travelers, and Kauai is our favorite tropical destination. We recently retired, and are enjoying our lives very much. We travel a lot, and Kauai is the most beautiful island we have ever visited. Sealodge is a very special place on a very special island. Sealodge is located in the beautiful north shore of Kauai. You are within minutes of some of the most beautiful beaches in the world. The Sealodge property is very quiet with lots of open green space to enjoy the magic that is Kauai. Both bathrooms have a powder room outside of the toilet/bathing area. You can view the beautiful Kauai mountains from the kitchen. There is a beach trail from Sealodge to a seculuded beach. Free parking next to condo. Pantry inventory varies. Be sure and check condo before you go grocery shopping. There are lots of children's beach toys such as shovels and pails. Loved the condo! The location was sublime and you could hear the calming ocean during the night. The balcony/porch had nice views and the reading sofa was perfect for relaxing. Kitchen had everything needed for cooking both nights and everything was nice and clean. Overall, a great place to stay and would return! Excellent stay! Would happily stay again! My husband and I stayed with our children, ages twelve and nine, in Tim and Cathy’s Sealodge property from Dec 30- Jan 5 and loved it! There was plenty of space and we really liked having two bathrooms. Our children really enjoyed window seat. The ocean view and the sound of the waves crashing could not be beat. There is so much to do and see on the north side of the island. Cathy was really great at communicating and answered all of my questions quickly. She also provided a list of information to help us orient ourselves quickly upon arrival. Thank you so much for the wonderful stay! We will definitely book at Tim and Cathy’s Sealodge property again! Comfortable stay. Minutes from Princeville center. Condo was immaculate! Exceeded expectations!!! We enjoyed falling asleep listening to the ocean - so very relaxing! Perfect location!!! Kathy Morris (owner) addressed our questions promptly before our arrival. No stress, easy - perfect!!! Thank you!! Gorgeous views, lots of room, amazing mini adventures to Sealodge Beach. Such gorgeous views from every window. Conveniently located on the North Shore near Hanalei Bay. South shore fun only took about and hour and fifteen minutes. SECRET SEALODGE BEACH! Seriously, breathtaking and private, and a fun jungle-y walk to get there. Plenty of fans for the hotter days in September. The towels provided are very tiny and very scratchy. Sort of a minor detail, but when we're showering a lot after beach time, it bothered us. The condo was simple, but nice and clean and adequate. We thought the location and view were great. We enjoyed exploring the north part of the island, even in the rain. Thanks, Cathy, for your hospitality! Reduced rate for stays longer than a week. We prefer checks, but can take a credit card. TAT # is on file.